Ok, to be honest, we've been reading the same books as last week. (At 2 1/2 years old, you can get away with a lot of repitition.) We're still reading the story of Lucy Entering the Wardrobe. He desperately wants to read the "sword fight" story but the illustrations of the White Witch's army are a little creepy. I've only let him look at the pictures of the battle between Aslan and the White Witch briefly. He doesn't seem bothered by it but not wanting to risk very much, I'm trying to keep him focused on Lucy and Mr. Tumnus. In order to win these two books, please leave a comment below. 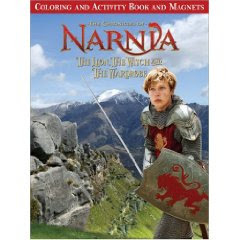 I will select and announce a winner at the conclusion of The Chronicles of Narnia Reading Challenge on July 17, 2009. 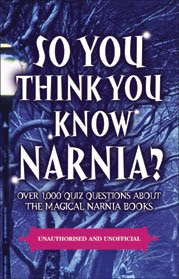 Also, if you have any suggestions for ways to introduce younger children (toddler aged) to Narnia - do let me know! I am happy to hear your suggestions!!! My girls would enjoy that coloring book, I think. Great post, Carrie. I don't have any suggestions, since I'm just now introducing my own dc to Narnia, and they're older than yours. I'm all ears, though. Oh, Carrie, I've never seen that SCC video! How have I missed that?!?!?! One of the families that I tutored for in WA had a pet mouse named Reepicheep. 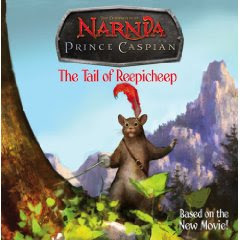 I just remember asking them to let me know if Reepicheep went missing. I prefer for mice by that name (or any name) to remain within the pages of a book. Otherwise, I need a ten-foot pole. Both very interesting looking books, Carrie. I hadn't heard of the C.S. Lewis book before, either, but it looks like one I would enjoy. PBS had a special a while back called The Question of God about the lives of C.S. Lewis and Sigmund Freud which I purchased recently on DVD along with the book that it was based on. It was a very interesting comparison of the two men's lives. I haven't read the book yet, but the DVD was very good. I have some nieces that would love to have these books. Please enter me. Wish I had known earlier about your Narnia challenge. However, I'd love to be entered in your book give away. These both look fantastic! We're huge Narnia fans here. I do wish there was some Narnia stories geared down for the little ones to start experiencing the world. Thanks for posting the SSC video. I have not seen that one. I enjoyed watching it. Thanks for running this challenge, I must admit, I have not done very well. I plan on reading this week...gasp! Although, I do plan on carrying through until we are down with the series.